It’s big, it’s bright and it has captured the fancy of many Edmontonians. On the north wall of the Crawford Block, a new condo tower just off Whyte Avenue, is a colourful mural. The grassroots-funded piece of public art features a human body with a dog head in vivid colours and geometric shapes. 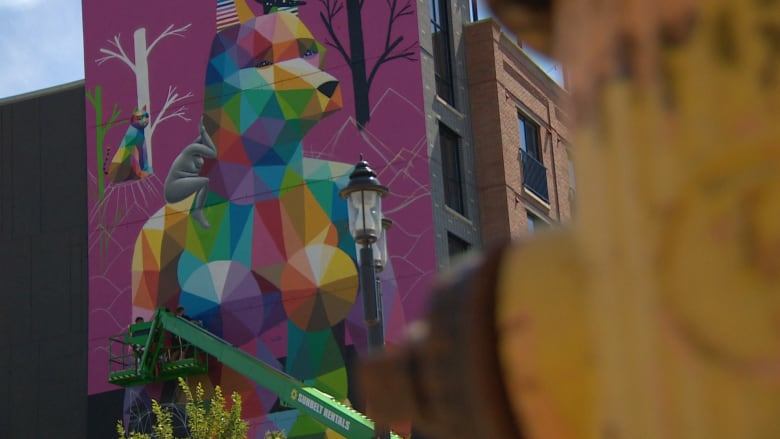 Spanish artist Okuda San Miguel has been painting the six-storey mural near the El Cortez restaurant in Old Strathcona since Saturday. The plan was to complete it on Wednesday, but reports on social media Monday night said the mural was completed at about 10 p.m. He was commissioned to do the large-scale public artwork after Edmonton’s Michael Maxxis and Fish Griwkowsky were able to raise more than $120,000 for the mural to be painted. “You just have to look at the mural to understand why we picked him,” said Griwkowsky. San Miguel is known for his colourful work around the world, including a mural recently painted in Toronto. He said he was inspired by Alberta’s landscapes and historical artwork for the Edmonton mural. “I want to go back to ancestral indigenous artworks where they mix animals and humans because they were so close to the animals in spirituality,” he said. Maxxis, who is one of the co-owners of El Cortez, hopes this mural inspires other art projects in Edmonton. “We just thought it was a great complement to the area and something that can kick-start more projects like this in the area and the city,” he said.